The standalone music players are gradually losing their charm in the age of high-end smartphones that can deliver good audio experience in everyday usage. Ask yourself when was the last time you invested in a dedicated music player to tune in to your music library? Most of us find solace in our smartphones that when paired up with high quality headphones easily does the job of being a good music player. However, for audiophiles who don't want to compromise on sheer audio quality, the standalone music players still hold ground. Having said that, one company that has given some top-of-the line music players and is continuously pushing the envelope in the realm of standalone music players, has launched their latest audio product in the Indian market. You may have guessed it by now and yes we are talking about Sony, the creator of 'Walkman' series of music players. Priced at Rs. 15,990, the NW-A35 is the company's latest addition to the high-resolution audio-player's line-up that packs in all sorts of tricks to please the audiophiles. 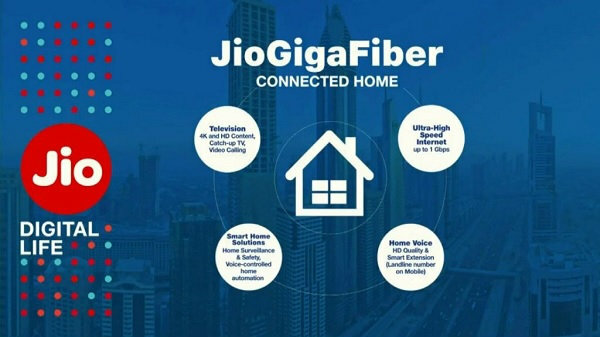 It was first showcased in CES 2017 and is now available in the Indian market. So is it the best from Sony that you can buy in this price-range, let's find out with the help of this review. If you own or have used Sony's recent Xperia handsets (especially Xperia XZ), you will instantly relate with the design of the NW-A35. The music player looks like a compact variant of the Xperia XZ handset and feels quite robust in hands. The design is nothing fancy and speaks of practicality. 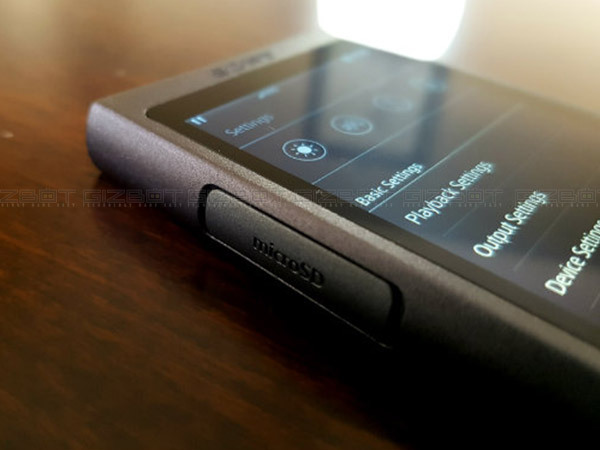 The right side of the music player has all the physical controls- the volume rockers, power button, play/pause button, hold switch that disables the physical buttons to avoid any accidental pushes and buttons to change the audio tracks. The device features a 3.1-inch WVGA (800x480) touch screen for operating and navigating the device. The screen is quite bright and aptly displays your entire music library, music player's settings and other required functions. However the touch response is not that good and sometimes you have to tap more than once to get the job done. 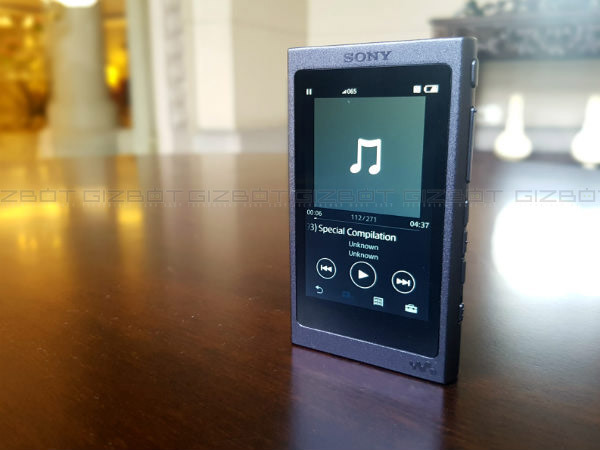 Overall, the Sony NW-A35 is a compact and subtly designed portable music player that presents a simple but practical design. The Walkman supports high-res audio formats which include MP3, WAV, AIFF, WMA, AAC, HE-AAC, FLAC, and Apple Lossless, among others. The music player also includes FM radio. The NW-A35 uses sound enhancement features like DSEE-HX and ClearAudio+, which work with the Walkman's S-Master HX digital amplifier. The Sony NW-A35 Walkman also features noise cancellation, cutting off external noise when travelling by bus, aeroplane and an office mode in case you are not in the mood to work and just want to enjoy your music library. With so much going on in the audio department, the in-built storage seems to be the weakest point of the NW-A35. 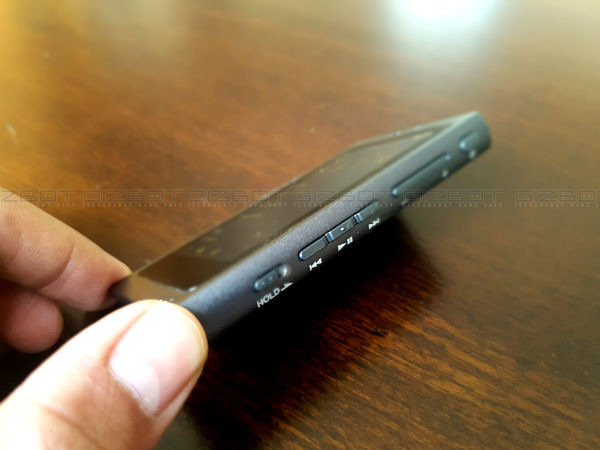 The Sony NW-A35 Walkman packs 16GB of inbuilt storage that is not going to please music enthusiasts who are willing to store high-resolution audio files such as FLAC files. However, you have the option to expand the storage by up to 128GB via a microSD card slot. Sadly, the package does not include a microSD card and the worst part; there are no earphones in the package. Moreover, the packaging also not offers any casing for the music player. To simply put, Sony has put everything in the audio player in terms of audio technology, and has cut the cost on the accessories part, which comes as a disappointment for an audio device priced at Rs. 16,000. For connectivity, the music player includes a 3.5mm stereo mini jack that allows you to use a variety of earphones and headphones. Besides you also get Bluetooth 4.2 that let you connect wireless earphones/headphones. The NW-A35 also supports NFC with one touch connectivity. The NW-A35 perfectly does the job it has been assigned i.e. to deliver lossless audio performance. 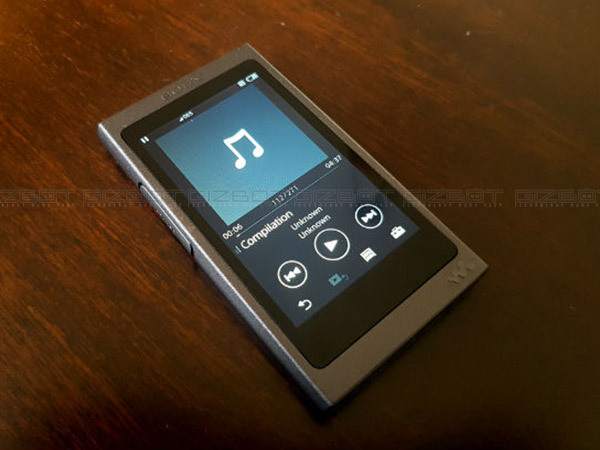 The compact music player supports a variety of file formats like AAC (Non-DRM), AIFF, ALAC, DSD, FLAC, HE-AAC, Linear PCM, MP3, WMA (Non-DRM). If you are true music enthusiast, the support for DSD, FLAC and ALAC formats delivering a rich listening experience will certainly please you. 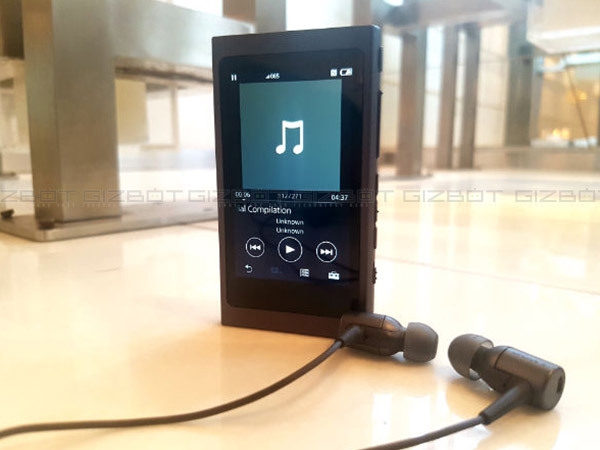 The built-in Digital Sound Enhancement Engine of the music player does a decent job of scaling the resolution of audio files, and the output is nothing but impressive. When we played various genres of music, the Walkman NW-A35 produced great sound signature with booming bass. The audio output was far better than what we were experiencing with the flagship handsets in the market. If you believe your high-end smartphone coupled with a pair of pricey headphones is the best thing you have ever heard, try this music player. The results will simply amaze you. While the FLAC files with ClearAudio+ (the digital signal processor) switched on sound brilliant, the standard CD files with ClearAudio+ switched off and DSEE HX switched on sounds equally pleasing. The DSEE HX basically upscales the existing music to near high-resolution quality. Besides, the built-in DC Phase Linearizer makes sure your audio files sound richer, crisper and warmer. Its impact on the overall audio quality is very subtle but bright. You can also connect your wireless earphones with the music player in case wires are not your thing; however the output in that case does suffer a bit. Sony also sent us a pair of Noise Canceling Headphones- the MDR-EX750NA, which are not for sale in the market but they are by far the best wired earphones we have tested in a while. Sony might make them available for consumers but as of now they are just for testing purpose to evaluate the audio quality of audio devices. Last but not the least; the built-in noise-cancellation technology of the music player blocks most of the outside noise, cutting distortion and noise across a wide range of frequencies. 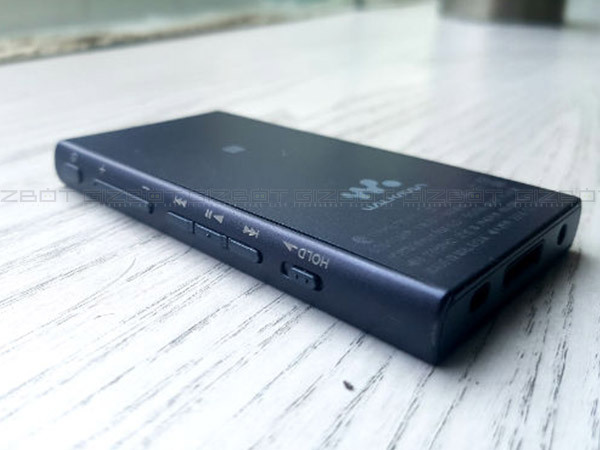 With battery charged to 100 percent, the Sony NW-A35 Walkman lasted for a good 18 hour on a mix of wired and wireless earphones playing multiple file formats. The audio player takes approximately 4 hours to reach 100 percent battery mark. 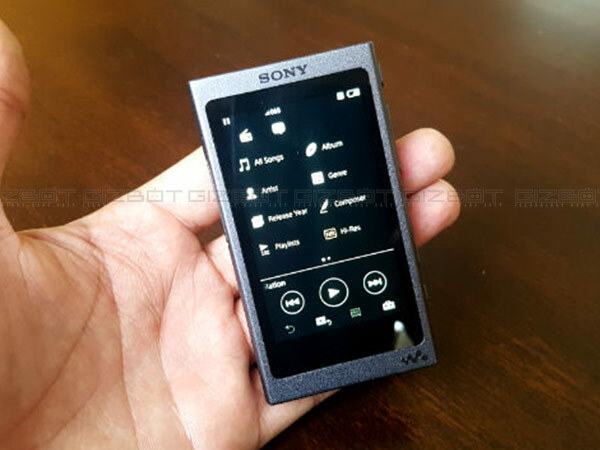 Sony has done a great job in designing and fitting such sophisticated audio technology in a compact form factor. The audio quality that the NW-A35 delivers is far better than what you would experience even on high-end flagship smartphones, which I believe are the real threat to the breed of standalone audio players nowadays. 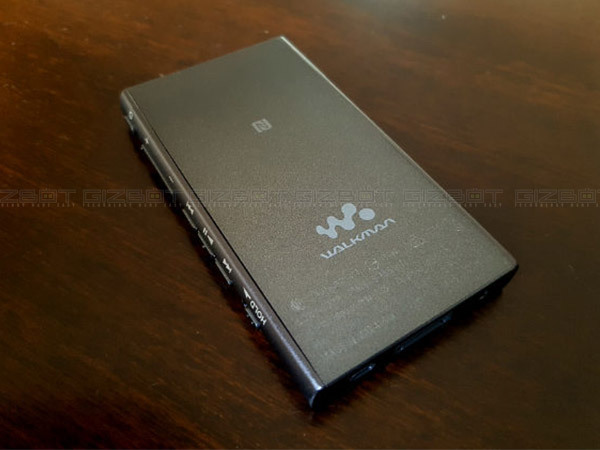 The NW-A35 Walkman is designed for audiophiles who want to invest in a music player that does not compromise on audio quality, but make sure you have a pair of good earphones, a microSD card and a carry pouch as Sony is not going to offer them in the package.